In a study of high-functioning adolescents with an autism spectrum disorder, scientists using functional brain imaging have found reduced connectivity selectively affecting parts of the brain that form circuits supporting social behavior. The findings sharpen the focus of previous reports suggesting disruptions in connectivity across the brain in autism, and offer a target for future studies to search for the genes that shape the development of these circuits and how they become disrupted in the disorder. Background Difficulties with communication and social interactions are central features of autism spectrum disorders (ASD), and are universally present in those with an ASD. In an effort to determine how brain function is disrupted in autism, scientists have used noninvasive functional brain imaging to explore connectivity in the brain—the extent to which patterns of activity in functionally related parts of the brain correlate with each other. Scientists increasingly see the brain and its disorders in terms of circuits, with a given behavior engaging multiple centers across the brain, functioning in tandem. 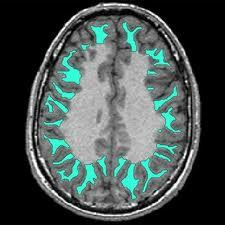 Functional imaging of people with an ASD has suggested that there are disruptions in connectivity across the brain. Narrowing the search to determine if losses in connectivity affect only specific circuits has been difficult, however. Mapping which centers of the brain are tightly connected in most people but disrupted in illness potentially involves comparisons in activity between thousands of points in different brain regions. Accordingly, previous studies have focused on a predetermined, small handful of regions to evaluate connectivity differences in ASD. This Study Stephen Gotts, Alex Martin and colleagues at the National Institute of Mental Health developed an approach to identify regions throughout the entire brain for which connectivity was reduced in ASD, and measure the magnitude of the reductions. The scans were done on 31 adolescents with ASD and 29 without the disorder, while they were at rest, not engaged in any task. Scan results revealed decreases in connectivity among those with ASD compared to individuals without ASD, concentrated in areas of the brain involved in social functions. In particular, the greatest decreases occurred between a cluster of brain regions involved in the emotional aspects of social behavior (the limbic brain) and two other clusters: one involved in language and communication and the other in the interplay between visual perception and movement. Moreover, participants in the study who had the greatest difficulties with social interactions were those in whom the decreases in connectivity were the most marked. Significance These data offer evidence in terms of brain activity to confirm what scientists have suspected but have been unable to examine systematically, that disruptions in connectivity in autism are concentrated in social centers of the brain. According to Dr. Gotts, what they found was not that this circuit was inactive, but that, among participants with ASD, patterns of activity in the three clusters of brain centers did not correlate with each other. “So a circuit that is normally in sync with the rest of the social brain has become decoupled. The limbic brain is composed of areas and structures that mediate emotional and affective components of our social interactions, so you can understand the social rules about how other people are behaving and acting. These brain regions are active in autism spectrum disorders and are coordinated amongst themselves, but they are not interacting appropriately with the rest of the social brain.” The clusters of brain centers identified in the study as functionally connected are also anatomically connected circuits. One of the most exciting aspects of the research, says Gotts, is that in humans, this brain circuit shows a different developmental growth trajectory relative to the rest of the brain's cortex during typical development. Since genes are responsible for guiding growth during development, these findings provide a target for searching for genes that drive abnormal growth and limbic circuit functioning in ASD. The differences in connectivity also offer the possibility of a “systems-level” marker—an indicator reflecting function across the brain—to use in developing and testing possible treatment. Local abnormalities in cell signaling or, alternatively, loss of longer range neuronal connections could explain the differences reported. If the differences can be traced to more local dynamics, it may be possible to identify new medications or behavioral therapies; variations in circuit activity as shown by functional brain imaging could be used as markers of whether therapy was effective. Brain regions showing decreases in connectivity in high functioning adolescents with an autism spectrum disorder (ASD) are shown to the left: Limbic-related regions involved in emotional/affective aspects of social behavior (shown in red), regions involved in social communication and comprehension (shown in blue), and regions involved in visual, somatosensory and motor aspects of social behavior (shown in green). In typically developing adolescents, these circuits are interactive and coordinated, exhibiting correlated patterns of brain activity over time (traces of neural activity would appear as illustrated in upper right plot). 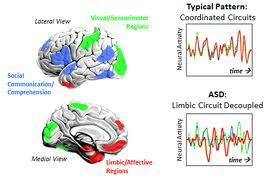 In adolescents with an ASD, the activity in the limbic circuit has become decoupled from the other social brain regions (see red activity trace in lower right plot). Activity within the limbic circuit itself remains coordinated but no longer interacts appropriately with the other two circuits nursing ceus Reference Gotts, S.J., Simmons, W.K., Milbury, L.A., Wallace, G.L., Cox, R.W., and Martin, A. Fractionation of Social Brain Circuits in Autism Spectrum Disorders. Brain 2012 doi:10.1093/brain/aws160.